It’s taken an awful long time to get to letting you know what’s occurring here at Twang Towers. So let me start with a thanks and an apology. First thanks to all of you who bought the BREATHE EASY CD. We were able to send a good chunk to the British Lung Foundation for their research program, and to fund some equipment for the Saffron Walden Breathe Easy Exercise Group, thank you all so much. Now…the apology! I’ve been informed that folks have been trying to contact me via Facebook. Fact is, the Facebook page was set up and run for me some time ago by a third party. Sadly that person is no longer with us and we had no way to get into the page. However, we now have a boffin on the case and all should be well soonish, I’ll keep you posted. If any of you want to get in touch, for the moment you can do it through the contact thingy on this plebsite. Leave me your e-mail address and I’ll get back to you as soon as….! 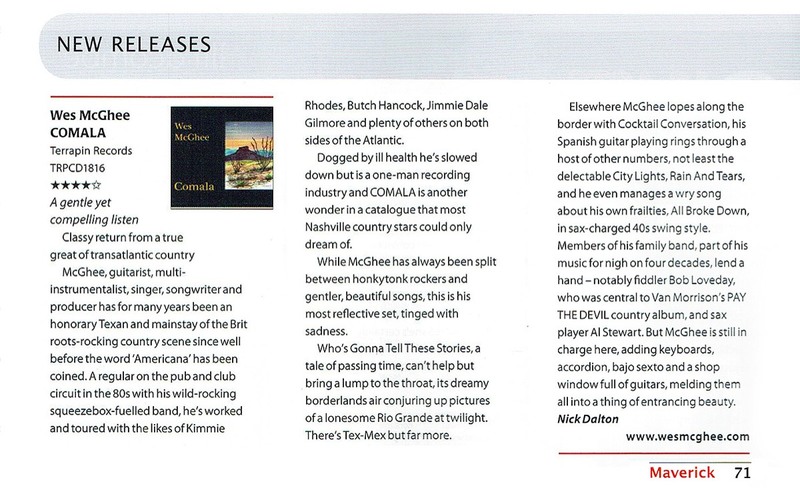 We got some nice reaction to the COMALA CD, some said it was one of the best yet, and I was happy to note that my song for my old friend and running buddy Dermot O’Connor was well received. ‘What happened to Vol’1?’ I hear you say. Well, if you have BORDERS you’ll know that CD3 of the set was called SCARS BARS & RED GUITARS. Some of you said you were missing favourite tracks from the past on the BORDERS set, so we’ve taken your suggestions into account…and decided to put it out anyway! There are tracks from the early vinyl records, cuts from the THANKS FOR THE CHICKEN Live in Texas album, plus unreleased cuts from our part -time geriatric rock n roll outfit VINCE & the VILETONES and Joaquin Romas, who is actually me on weird days! Meanwhile, back at TWANG TOWERS me and the gentlemen of the orchestra have begun recordings for a NEW as yet untitled 2CD set. 30, yes 30 brand new songs. Last summer I had a fall. Something to do with some whisky I had that had probably gone off…maybe…anyway I fell on my head and left most of the contents (brain included) over the front steps of Twang Towers. After the hospital had bandaged up my head to make me look as ridiculous as possible (and no I’m NOT showing you a picture) and sent me home I started to write songs and more songs and then a few more until I had more than enough for a 2CD set. Now, any normal person would probably do one album and then put their feet up for a while but I decided to do the lot! CD1 will have a mellowish feel with a lot of Spanish guitar, tres Cubana, etc, while CD2 is out and out country rock and roll and blooze. We’re hoping to release it late this year. Finally, I’ve been told by folks who ‘know about things’ that I should be posting a thing called a ‘Blog’ on this site on a regular basis. Hmmmm. I could bore you all with tales of excess on the road, but in all honesty I only ever chucked the furniture out of my hotel window into the swimming pool once, it was very satisfying and the hotel deserved it but being a rather reserved chap I didn’t make a habit of it. So, no road tales, unless you force me of course!!!!!!!! They said I should do a ‘getting to know me’ thing (who ARE these people?). Anyway I’ve started by filling in one of those daft questionnaires you find in the Sunday papers. This will help you not a jot! I thought I’d do a semi-regular thing and call it. ’10 Things…. !’ And the first one you will find if you touch the ‘Twangballs’ button. #2 next time will be about who knows what: favourite records, recipes, maybe guitars, or how about the ten worst gigs ever! I’m open to suggestions. Thanks for reading these words from El Twang’s book of nonsense. 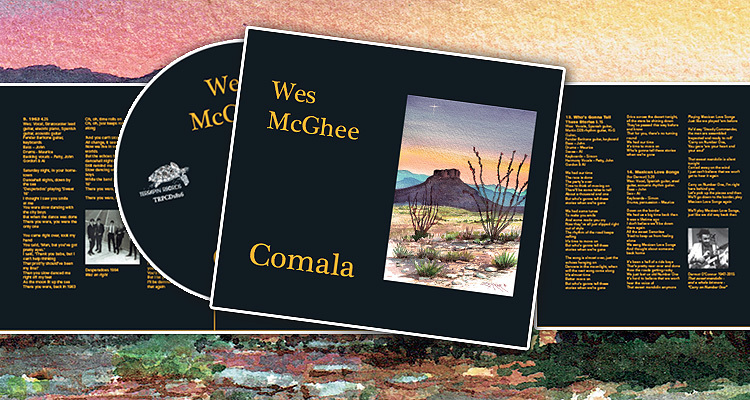 New album ‘COMALA’ available now! The last twang has been twanged, the last sax has been honked and as the last echoes die down in the studio the brand new Wes McGhee album is finally finished! Wes’ constant battle with emphysema has slowed down the making of this album considerably, but those who’ve heard these 14 brand new tracks say it’s been well worth the wait. Musically on a par with his classic ‘Landing Lights’ and ‘Zacatecas’ albums and lyrically probably his best yet. Although packed with references to the passing of time and its inevitable losses, this is by no means a navel-gazing downbeat affair. Who else but McGhee would set a song about his ailments to an upbeat swing blues tune? Accompanied by long time band mates John Gordon (bass), Maurice McElroy (drums & percussion), Al Stewart (saxes), Simon Webb (keyboards) and Patty Vetta and Barty (vocals), Wes plays a host of guitars, oud, mandolin, bajo sexto, harmonica, banjo, dobro and keyboards and with influences as diverse as blues, swing, flamenco and tex-mex all melded into the familiar McGhee sound, this one’s a winner all the way. The album kicks off with an Arabian oud playing a blues (‘the weirdest thing I could think of’ says Wes) and ends with a poignant tribute to Dermot O’ Connor, long time band member, who we sadly lost last year (2015). Wes and Dermot had planned to record together again but both had serious health issues and when it became clear that it wouldn’t be possible, Dermot asked Wes to write him a song. A promise is a promise and the song recalls their days in Texas when a break from recording or gigging meant a chance to head for the Mexican border and maybe drink a tequila or three. Two paintings by David Zettner on the CD cover make this a classy looking package. David and Wes toured together many times in Europe and the US with Kimmie Rhodes and on Wes’ 3CD retrospective ‘BORDERS’ David plays steel on tracks that were recorded at Willie Nelson’s studio in Pedernales Texas. Sadly, David is no longer with us. He was a fine musician on guitar, pedal steel and bass, a wonderful artist and a good friend to Wes. The correct answer is … none of the above! he’d most like to have written. The story unfolds in the Mexican desert town of Comala , a place so hot, Rulfo tells us, that if someone dies and goes to hell they come back to get a blanket. Comala, it transpires, is deserted, a town inhabited by the ghosts and spirits of the past. This album I guess is my Comala. So … for the ghosts of the miles and the trials and occasional smiles that were around for a while, then just slipped out of style - and were gone! One more time. Wes and Dermot in full flight, back in the day! 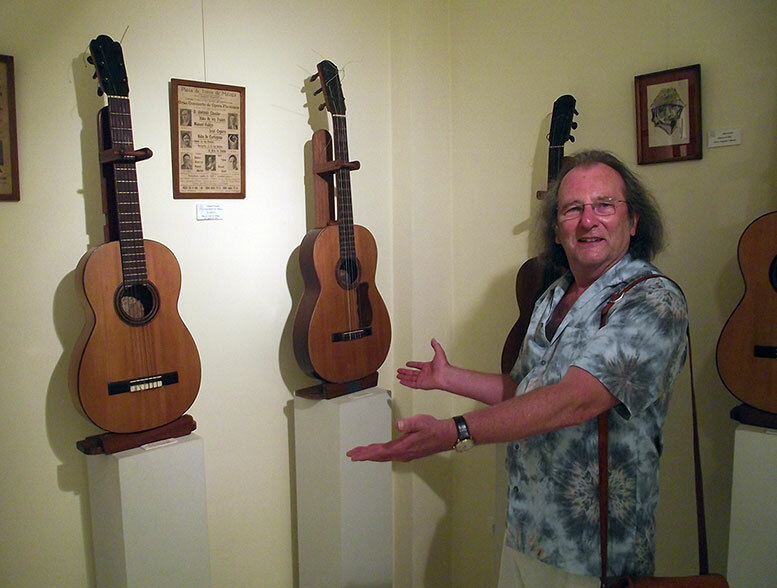 Here's a happy snap of Wes at the Juan Breva Flamenco Museum in Malaga, admiring guitars that belonged to Juan Breva - one of the few flamenco singers who accompanied himself on guitar - and the Granada poet Federico Garcia Lorca. 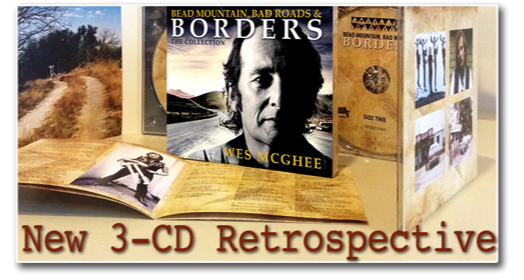 A new 3-CD retrospective collection from the back pages of Wes McGhee. Re-mastered and presented in a classy digipac, containing the double CD "Bead Mountain, Bad Roads and Borders", a homage to Roxy Gordon and Texas, plus Bonus CD "Scars, Bars and Red Guitars" and a booklet with extensive background notes and credits. Lyrics for all 43 songs are currently available on this website. Just click on SHOP and be the first kid on your block to get a copy. Even if you already own some of these tracks, you never heard 'em like this before! Wes has recently been involved in the making of a fund-raising CD featuring 11 songs, some relating to breathing, some all-time favourites and 2 for Christmas. The title: BREATHE EASY. The Artists: The Chorus of Peculiar Distinction. The object: to raise funds for the British Lung Foundation and Saffron Walden Breathe Easy Group, at the same time raising awareness of COPD. While being a handy acronym for the Chorus, COPD also stands for Chronic Obstructive Pulmonary Disease, which can manifest itself as emphysema, bronchitis cystic fibrosis or asthma. Most of the members of the Chorus suffer from one or more of these conditions – in Wes’s case, severe emphysema. Research by the British Lung Foundation has found that one of the best activities for easing the symptoms of COPD is … singing! So the Saffron Walden Breathe Easy Group introduced a singing session after exercise classes. These sessions proved to be hugely enjoyable, beneficial and lifted everyone’s spirits. 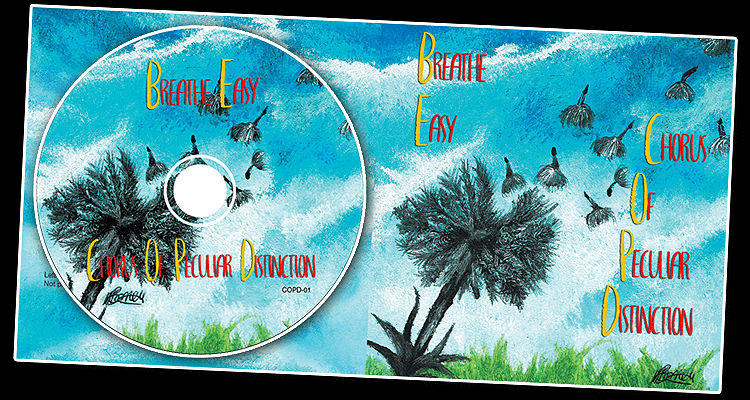 When the idea of making a fund-raising CD came up Wes wrote the upbeat title song, which takes a positive view of the help given by the Breathe Easy classes and is in itself an exercise in breath control. He provided musical arrangements and production and with the help of some of his long time band members Maurice McElroy (drums), Al Stewart (saxes) and Patty Vetta (harmony coach) basic tracks were laid down. In a series of sessions at Glebe Studio, involving much hilarity, the Chorus added their voices to bring the project to fruition. Although everyone involved had a lot of fun during the making of the CD, COPD is a serious disease and the British Lung Foundation needs support to fund research and to help keep the Breathe Easy Groups going. While Groups like this continue to help COPD sufferers become fitter and have a greater understanding of how to cope with their illness, there will be fewer hospital admissions and consequently less strain on the NHS. You can help the British Lung Foundation and the Saffron Walden Breathe Easy Group by buying the BREATHE EASY CD from our SHOP.